No one was surprised when two groups filed for a Pittsburgh franchise in the winter of 1983. It did come as a considerable surprise that DeBartolo, Sr. was one of them, given his son’s ownership of the 49ers. However, while the other group contented itself with holding a rally to demonstrate support for a potential franchise, DeBartolo stole a march by securing an all-important lease for Three Rivers Stadium. A few days later, DeBartolo’s longtime right-hand man, former Steeler Paul Martha, informed the other owners and Commissioner Chet Simmons that his boss was not only applying for a franchise, but already had a lease. There was some debate over whether to approve DeBartolo’s bid, with some fearing that they were effectively allowing an NFL owner into their circle. It was an open secret that Eddie, Sr. and Eddie, Jr. worked closely together. Ultimately, the owners realized that DeBartolo would lend the upstart league instant credibility and unanimously approved his bid, making him the first owner of a USFL expansion team. Unusually, DeBartolo applied for the franchise in his own name, rather than setting up a corporation or partnership. He also paid the full $6.25 million expansion fee up front. The NFL itself threatened an investigation over a possible Cleveland Spiders-style conflict of interest due to the father owning a USFL team and the son owning an NFL team, an accusation both father and son insisted was not the case. Ultimately, the NFL asked Eddie, Jr. to leave the room during any USFL discussions. The Pittsburgh Maulers were a team that competed in the 1984 season of the United States Football League. 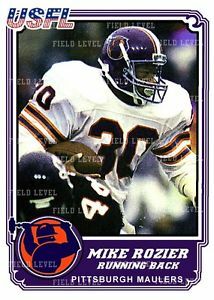 Their most prominent player was first pick overall in the 1984 USFL draft, running back Mike Rozier of Nebraska, who won the Heisman Trophy, collegiate football’s most prestigious individual award. Maulers – A name-the-team contest yielded the nickname "Maulers," after the sledgehammer-wielding workers in steel foundries. DeBartolo was a strong believer in the USFL’s original spring football concept, and he knew the Maulers could not hope to go head-to-head against the Steelers. A move to Cleveland, closer to DeBartolo’s home in Youngstown, was quickly ruled out; even without the daunting task of competing with the Cleveland Browns to consider, it is not likely that Cleveland fans would have accepted a refugee from Pittsburgh. As a result, just a week after the vote to move to the fall, DeBartolo folded the franchise without so much as a press conference. 1983 – 1984 / Edward J. DeBartolo, Sr.
Who is the greatest Pittsburgh Maulers? The Pittsburgh Maulers were a team that competed in the 1984 season of the United States Football League.